This video (tap on link) recaps the progress made in the modernization of the Panama Canal, the first major improvements in the waterway in one hundred years. Thousands of workers grade the earth, pour concrete, dredge a widened waterway, and install gigantic lock gates manufactured thousands of miles away and transited by barge to Panama. This entry was posted in Water transportation and tagged Panamax on October 30, 2015 by Florida's Big Dig. Region: Atlantic ICW – FL & St. Johns R.
Spoke with a friend who wants to remain anonymous. Local towing company was contacted to pull it off the grounding. But, the grounded boat draws 8 feet and was too hard aground to be successfully pulled from the sandbar. Titan Salvage has been contacted to do salvage operations. When other locals (non-professionals) tried to assist in rescuing crew members from the boat, they mentioned that the steel deck felt thin. The crew aboard also reported (to these good Samaritans) the boat had leaking shaft seals prior to grounding. The boat is now starting to roll over with the low tide and waves. The Martin County Sheriff’s Marine Units, along with our Air Unit, are working to assist the United States Coast Guard with evaluating the size of a large fuel leak and debris field caused when a supply vessel headed to Haiti partially sunk. 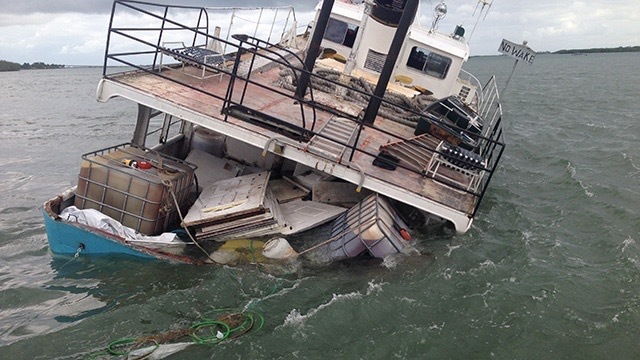 The 59-foot vessel began sinking sometime this morning near the crossroads, where the St. Lucie River and intracoastal waterway meet. You can see debris and fuel floating for miles along the waterways. Last night, the Coast Guard removed the boat’s passengers, after declaring the vessel unsafe to sail. MCSO’s Marine Units, and Chief Pilot, Deputy Doug Newsom, have been working throughout the day pinpointing and collecting debris, which has been spotted floating for miles. That debris includes barrels, boxes of food, produce, and miscellaneous supplies. The vessel was reportedly part of a mission headed to Haiti. The United States Coast Guard is leading the investigation into the incident. We will update you, as information becomes available. An aerial view from the MCSO Air Unit will be posted shortly. The Martin County Sheriff’s Department Facebook post includes 23 photos of the grounding and fuel spill. This entry was posted in Uncategorized on October 29, 2015 by Florida's Big Dig. This entry was posted in Uncategorized on October 25, 2015 by Florida's Big Dig. Don Wilson, hydroplane speed boat racer, died on June 19, 1966, on a day forever remembered as Black Sunday, when three driver died in two separate accidents in two venues on the same day. Don Wilson, younger brother of Stu Wilson, also a hydroplane racer, died in a fiery crash in Acalpulco, Mexico, on June 19, 1966, when Don collided with another hydro driven by Rex Manchester. Hours earlier, in a single crash, Ron Musson died in Washington, D.C.., on the Potomac River, vying for the President’s. Cup. The death of all three on the same day has come to be forever known as Black Sunday. This entry was posted in Uncategorized on October 23, 2015 by Florida's Big Dig.